You may have seen our weekly report on witness earnings. If not, you can find our latest report here. We are proud to announce that we will be running another weekly report. This is the first, and as such, we would love to get any and all feedback on our work. 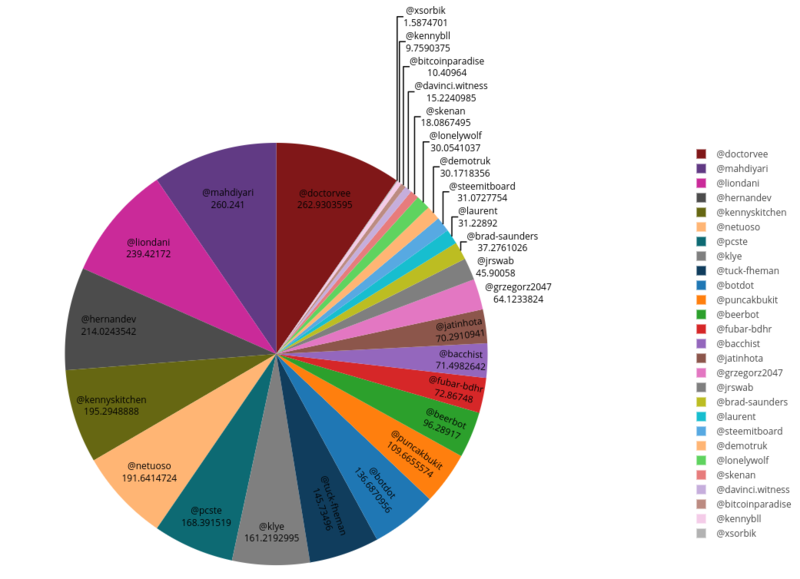 Let us know which charts aren't readable, which ones you love, and what you think we're missing. This report, like our earnings reports, has been produced using @steemsql by @arcange. Ever since @arcange changed over to a paid model, the service has worked flawlessly and has continued to be upgraded with new features. The earnings made through using the service have more than paid for the cost, and the product continues to get better and better. Other tools used in creating the report include steem-python, plot.ly, RAWGraphs.io, and the coinmarketcap python library. We expect that this report will continue to get more sophisticated, and are confident that these tools can scale up. The report is based on the premise that transfers out of the platform constitute a "withdrawal." Whether the funds are being stored in an external wallet, exchanged for other currency, being transferred to another user in a more anonymous manner than Steemit allows, or being converted to fiat currency is up for debate. We will not comment on whether any of these activities are inherently "good" or "bad" for the platform. The goal with this report is to provide another layer of transparency that Steemians can use to make informed voting decisions for witnesses. For the purposes of this report, data was pulled for a week-long period, from 12:00 AM on March 5th, 2018 to 11:59 PM on March 11th, 2018. The data included all transfers from active witnesses to @blocktrades, @poloniex, @bittrex, @changelly, or @openledger. Please let us know if we missed any major exchanges that trade or accept STEEM or SBD. The data was separated into STEEM and SBD transfers which were also converted to USD Values using current pricing from CoinMarketCap. You may also notice that @blocktrades is not included in the list (other than as an exchange). @blocktrades, due to being an exchange continuously makes a number of very large transfers, which tend to skew the data for normal witnesses. So, for the time being, they have been excluded from the report. Without further ado, the results of our first report. 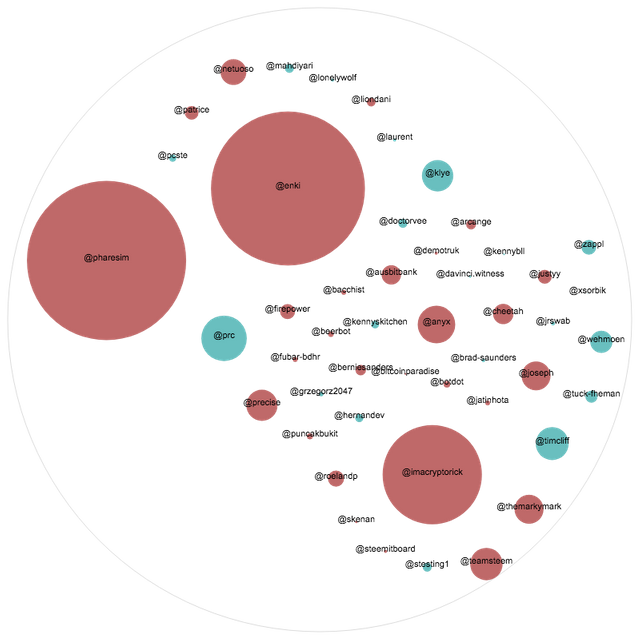 The below cluster chart shows the relative amount of withdrawals for each witness. 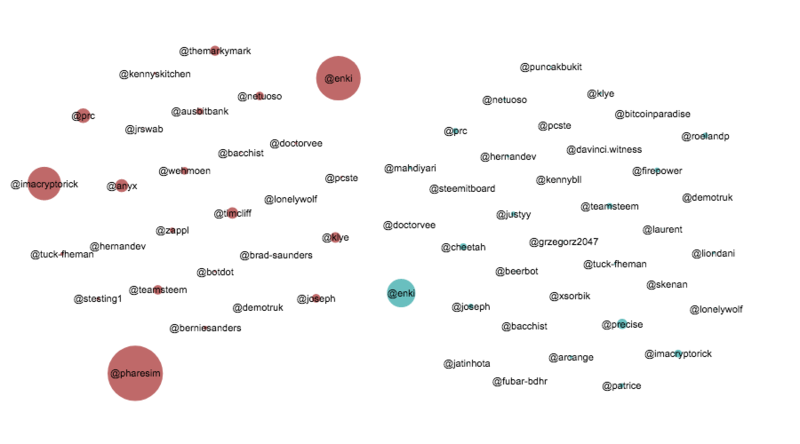 The red bubbles on the left are STEEM withdrawals, while the blue on the right are SBD withdrawals. 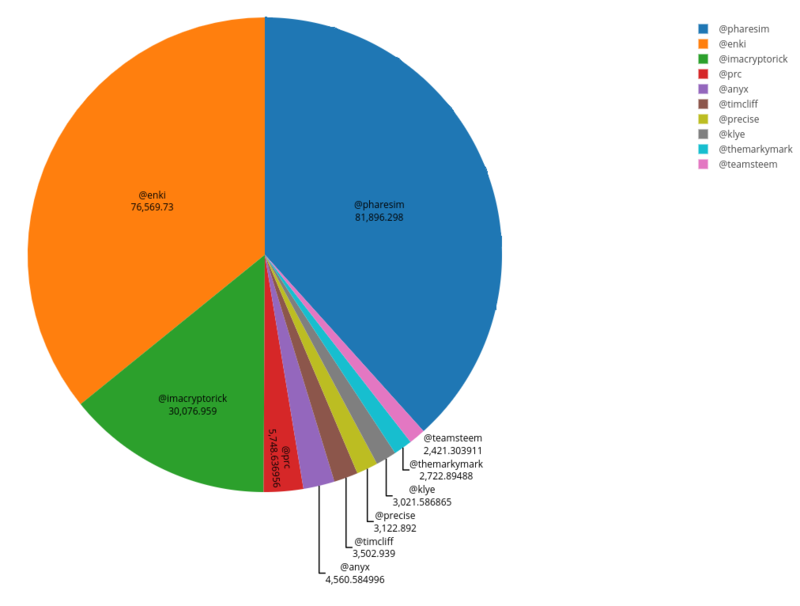 As you can see @pharesim, @enki, and @imacryptorick have withdrawn the largest amount this week. 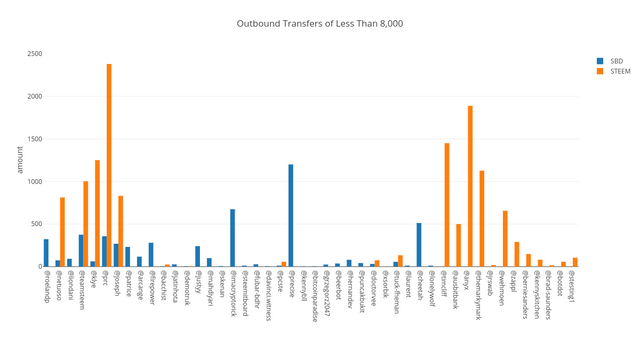 Here is a chart showing the largest 3 outbound transfers for the week. These are the only witnesses that transferred out more than 8,000 STEEM and/or SBD for this week. All other witnesses came in well below 8,000. As you can see here, of the witnesses in this chart, @prc, @anyx, @timcliff, @themarkymark, and @precise have also made significant withdrawals of STEEM and/or SBD. 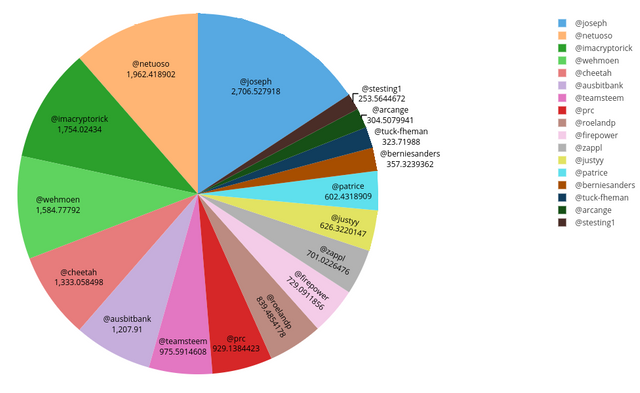 These piecharts break down the USD Value of each witnesses' withdrawals. These witnesses withdrew the USD equivalent of over $1000 in STEEM and/or SBD. Here are the witnesses that transferred out between $100 and $1000 USD Value in STEEM and/or SBD. 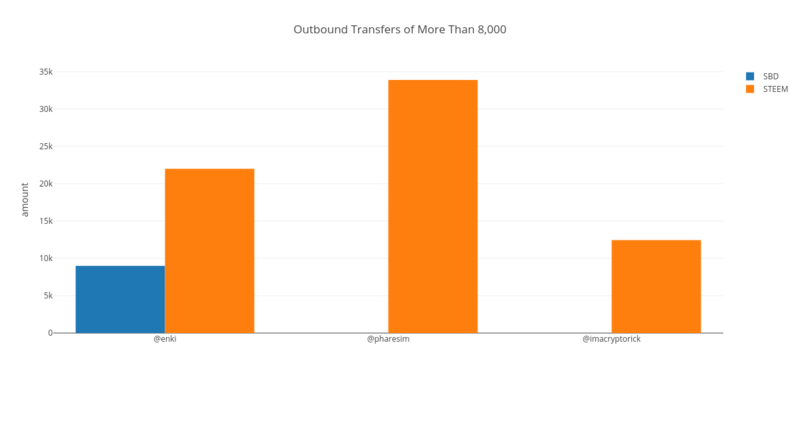 These witnesses bring up the bottom of the transfer list, with each pulling out less than $100. As always, here is the table that was used to generate the above charts. Each witness' ranking can be found, as well as the exchange of choice for their withdrawals. Congratulations! This post has been upvoted from the communal account, @minnowsupport, by jaredcwillis from the Minnow Support Project. 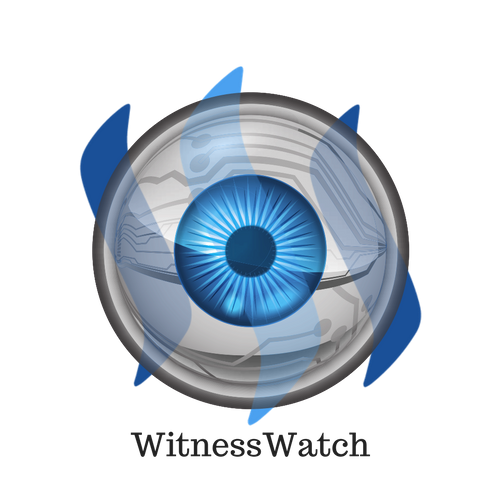 It's a witness project run by aggroed, ausbitbank, teamsteem, theprophet0, someguy123, neoxian, followbtcnews, and netuoso. The goal is to help Steemit grow by supporting Minnows. Please find us at the Peace, Abundance, and Liberty Network (PALnet) Discord Channel. It's a completely public and open space to all members of the Steemit community who voluntarily choose to be there.